42 The PCB Magazine • September 2016 and requirements for electrical testing of un- populated printed wiring boards. (Spoiler alert: There is a revision B forthcoming.) Both the IPC 6012 and military specifications tag this docu- ment as reference. With that said, let's now explore the military and aerospace aspects of electrical testing. From the aforementioned military specifications, we will first look at MIL-PRF-55110. This specifi- cation rests at revision "H" w/Amendment 1. Although this specification is still called out in today's manufacturing, it actually was retired in December 1997. Although the specification is still maintained for historic builds the no- tation on the cover states that post December 1997 MIL-PRF-31032 should be used. The main question here is whether I can flying probe my product under this specification or do I have to build fixtures to test? The simple answer is yes. The use of flying probes for testing under this specification is allowed. Requirements are specified in section A.3.7.5 and A.4.8.5  . Indus- try standard adjacency window value is used however unless otherwise specified vertical ad- jacency must also be used. The used of indirect testing by signature comparison is also allowed. See section A.3.7.5.1 of the specification for ref- erence on this attribute. MIL-PRF-50884 is the specification around flex and rigid-flex circuits. The specification rests as MIL-PRF-50884 "F" w/Amendment 1. Again, the question regarding fixtures or flying probes? Again, the answer is yes. These requirements are listed beginning in section A.3.7.5  . The use of indirect testing by signature comparison is also allowed for production screening. See section A.3.7.5.1 of the same specification. Now the big one, MIL-PRF-31032. This is the new specification "Printed Circuit Board/ Printed Wiring Board, General Specification For." This specification currently rests at revision "B" w/Amendment 1. The caveat here is that though this is the general specification there are list of build classifications with different perfor - mance requirements. These are referred to as the "Slash Sheets." This is where it can get tricky. One requirement from the Defense Logistics Agency Land and Maritime is that when a test is performed and the Certificate of Compliance is generated they require not only the specifica- tion used but the specific class and amendment level. There are six class levels under the MIL- PRF-31032. They are: /1C w/Amendment 2, 2B w/Amendment 1, 3B w/Amendment 1, 4B w/ Amendment 2, 5A and 6A. Each of these address a specific build class. 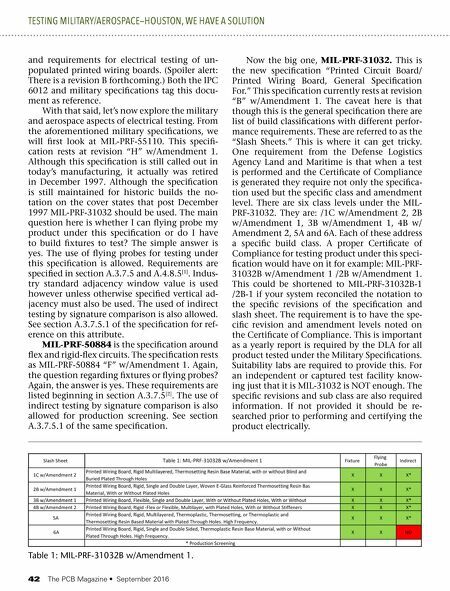 A proper Certificate of Compliance for testing product under this speci - fication would have on it for example: MIL-PRF- 31032B w/Amendment 1 /2B w/Amendment 1. This could be shortened to MIL-PRF-31032B-1 /2B-1 if your system reconciled the notation to the specific revisions of the specification and slash sheet. The requirement is to have the spe- cific revision and amendment levels noted on the Certificate of Compliance. This is important as a yearly report is required by the DLA for all product tested under the Military Specifications. Suitability labs are required to provide this. For an independent or captured test facility know- ing just that it is MIL-31032 is NOT enough. The specific revisions and sub class are also required information. If not provided it should be re- searched prior to performing and certifying the product electrically. 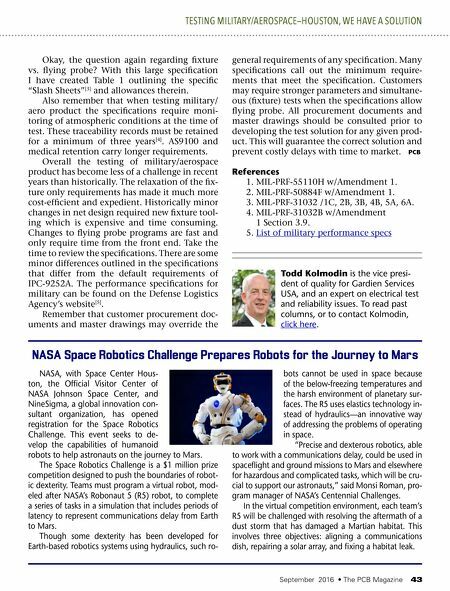 TESTING MILITARY/AEROSPACE—HOUSTON, WE HAVE A SOLUTION Table 1: MIL-PRF-31032B w/Amendment 1. Column — Are We Flying Yet? Feature Column — Does your Product have a Military Application?